- 10% Discount on almost all products. Actually now we offer it for ALL products but in the future we may have to exclude some new low-margin products or items on sale. You cannot use a coupon code in addition to this discount. 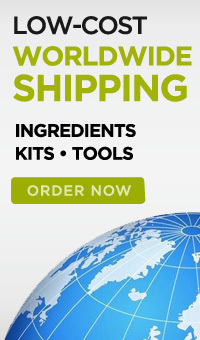 - Fast Shipping in the US and LOWEST global shipping costs. If you are located outside the US, we have negotiated the lowest shipping prices and fast delivery services with carriers and we’ll be passing the savings on to you. Your account manager will also work with you to optimize each shipment and reduce the costs even further. - Dedicated Account Manager so you can rely on us 100%. In our research kitchen, we continually test new ingredients and compare brands to make sure our customers have access to the latest and best products. Our knowledgeable account managers are familiar with all the research findings, ingredients and tools so they can recommend the right product for your specific application. - Restaurant Promotion to the largest community of modernist cuisine fans and experts. Promote a new accomplishment, seasonal menu, award and more. We’ll work with you to make this fruitful for you and the community. Drive customers to your restaurant and boost sales with these marketing and promotional resources. - Research to Answer Puzzling Questions. We are constantly experimenting with new techniques, equipment and ingredients and we collaborate with some of the best chefs and scientists in the industry including Harvard, MIT, Oxford University, Foodpairing, AAGM (partnered with Fundacion Alicia). If you have any unanswered questions we’ll use our resources to help you as much as we can. - Access to new cutting edge products before anyone else. Some new products are usually available in limited quantities; we’ll make sure you get them before anyone else. 1- Make an initial purchase of $500 from our online store or spend $500 within 7 days. If you are not ready to spend that amount, you can just purchase a gift card to reach $500 and then use it later when you have the need. If you prefer, you can contact us to make the payment and we’ll add credit to your account. 2- Once you made the initial purchase, send us the information below via this form and we’ll assign you an account manager, upgrade your account to a Restaurant Supply Membership and credit back to your account the 10% discount so you can use it in your next order. All future orders will have the 10% discount applied automatically. To maintain the membership, you need to spend at least $500 per 12 month period. Only restaurant businesses qualify to apply for a Restaurant Supply Membership account. KQ2 Ventures LLC, owner of MolecularRecipes.com, reserves the right to change the Restaurant Supply Membership benefits or discontinue it at any time. You agree that we shall not be liable to you or any third-party for any termination or disabling of this membership program.